The gray ugly is a very good general purpose fly. 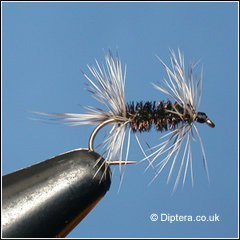 The fly can be fished static or on a varied retrieve using a floating line. The pattern is very similar to the "Double Badger" except that it uses two grizzle hackles instead of the badger hackles.